For other uses, see Marlborough. For other uses, see Marlboro. 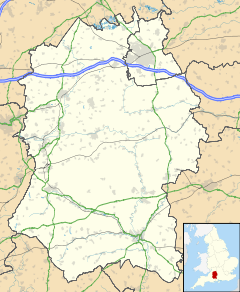 Marlborough (/ˈmɔːlbərə/ ( listen) MAWL-bər-ə, /ˈmɑːrl-/ MARL-) is a market town and civil parish in the English county of Wiltshire on the Old Bath Road, the old main road from London to Bath. It boasts the second-widest high street in Britain, after Stockton-on-Tees. The town is on the River Kennet, 24 miles (39 km) north of Salisbury and 10 miles (16 km) south-southeast of Swindon. The earliest sign of human habitation is a 62-foot-high (19 m) prehistoric tumulus in the grounds of Marlborough College. Recent radiocarbon dating has found it to date from about 2400 BC. It is of similar age to the larger Silbury Hill about 5 miles (8.0 km) west of the town. Legend has it that the Mound is the burial site of Merlin and that the name of the town comes from Merlin's Barrow. More plausibly, the town's name possibly derives from the medieval term for chalky ground "marl"—thus, "town on chalk". However more recent research, from geographer John Everett-Heath, identifies the original Anglo-Saxon place name as Merleberge, with a derivation from either the personal name of Mærle combined with beorg (hill), or meargealla beorg: hill where gentian grows. On John Speed's map of Wiltshire (1611), the town's name is recorded as Marlinges boroe. The town's motto is Ubi nunc sapientis ossa Merlini ("Where now are the bones of wise Merlin"). Further evidence of human occupation comes from the discovery in St Margaret's Mead of the Marlborough Bucket, an Iron Age burial bucket made of fir wood with three iron hoops, a top bar and two handles; it also sports bronze bands decorated with human heads and mythical animals, and is now on display at the Wiltshire Museum in Devizes. Roman remains and the large Mildenhall Hoard of coins have been found two miles to the east of Marlborough, at Mildenhall (Cunetio). A later Saxon settlement grew up around The Green and two early river crossings were made at Isbury Lane and Stonebridge Lane. In 1067 William the Conqueror assumed control of the Marlborough area and set about building a wooden motte-and-bailey castle, sited on the prehistoric mound. This was completed in around 1100. Stone was used to strengthen the castle in around 1175. The first written record of Marlborough dates from the Domesday Book in 1087. William also established a mint in Marlborough, which coined the William I and the early William II silver pennies. The coins display the name of the town as Maerlebi or Maerleber. He also established the neighbouring Savernake Forest as a favourite royal hunting ground and Marlborough castle became a Royal residence. Henry I observed Easter here in 1110. Henry II stayed at Marlborough castle in talks with the King of Scotland. His son, Richard I ("Coeur de Lion") gave the castle to his brother John, in 1186. King John was married here and spent time in Marlborough, where he established a Treasury. In 1204 King John granted Charter to the Borough which permitted an annual eight-day fair, commencing on 14 August, the vigil of the Feast of the Assumption of Our Lady (15 August), in which "all might enjoy the liberties and quittances customary in the fair at Winchester". He also established that weekly markets may be held on Wednesdays and Saturdays. These continue to this day. Later, Henry III was also married here. Henry III held Parliament here, in 1267, when the Statute of Marlborough was passed (this gave rights and privileges to small land owners and limited the right of the King to take possession of land). This seven-hundred-year-old law states that no-one shall seize his neighbour's goods for alleged wrong without permission of the Court. Apart from Charters, it is the oldest statute in English law which has not yet been repealed. The castle fell into disrepair by the end of the 14th century but remained Crown property. Edward VI then passed it to the Seymour family, his mother's relatives. In 1498 Thomas Wolsey was ordained priest in (the now redundant) St Peter's church. He later rose to become a cardinal and Lord Chancellor. In 1642 Marlborough's peace was shattered by the English Civil War. The Seymours held the Castle for the King but the town was for Parliament. With his headquarters in nearby Oxford, King Charles had to deal with Marlborough. "A Town the most notoriously disaffected of all that Country, otherwise, saving the obstinacy and malice of the inhabitants, in the situation of it very unfit for a garrison... this place the King saw would prove quickly an ill neighbour to him, not only as it was in the heart of a rich County, and so would straighten him, and even infest his quarters." The King sent Lord Digby to take the town who left Oxford, the head of four hundred horses, 24 November 1642. When he arrived, he chose to parley first, thus giving the inhabitants a chance to prepare defences and to recruit troops. They mustered about seven hundred poorly armed men. At this point, the town issued a reply to Digby: "The King's Majesty, providing he were attended in Royal and not in war like wise, should be as welcome to that town as ever was Prince to People; but as to delivering up the good Town of Marlborough to such a traitor as Lord Digby ... they would sooner die". After some early skirmishes, Royalist troops infiltrated the town down its small alleyways. The town was captured and looted and many buildings were set ablaze. One hundred and twenty prisoners were marched in chains to Oxford. The town was later abandoned by the King and took no further part in the war. On 28 April 1653 the Great Fire of Marlborough started in a tanner's yard and spread quickly, eventually after four hours burning the Guildhall, St Mary's Church, the County Armoury, and 244 houses to the ground. During the rebuilding of the town after the Great Fire, the high street was widened and is often claimed to be the widest in England though the actual widest is in Stockton-on-Tees. This wide street allows ample space for the local market. Fire swept through the Town again in 1679 and again in 1690. This time, an Act of Parliament was passed "to prohibit the covering of houses and other buildings with thatch in the Town of Marlborough". In 1804 the Marlborough White Horse was cut by boys from Mr Greasley's Academy in the High Street. In 1901 and 1934 the boundaries of the borough were extended to include the hamlet of Preshute (which was separated from Preshute civil parish) and the village of Manton, both to the west of the town. In 2004 Marlborough celebrated 800 years of its Town Charter. Among the celebrations were a street play by the Marlborough Players titled Wheels of Time, and a visit from HRH Prince Charles. Marlborough has an oceanic climate somewhat influenced by its inland position and at 124 metres' elevation is more prone to frost than southern coastal areas. Every summer the town holds a jazz festival with local pubs, clubs, hotels and various other venues playing host to live jazz music over the course of a weekend. The Marlborough mop fair was originally a hiring fair for agricultural workers seeking employment, but now has become a travelling funfair. It takes place over two weekends in October, as the "big mop" and "little mop" fairs. In 2014 these were set for 3–4 and 17–18 October. On the north side of the high street is the Merchant's House, which is currently under restoration but part of which is open to the public for guided tours on Tuesdays, Fridays and Saturdays from April to October. The house was built following the Great Fire of 1653. It was the property of a silk merchant and, rarely for a house of this type in a town centre, still retains its original room pattern. Notable are the wall paintings recently uncovered, which are undergoing conservation. One room painted in a striped pattern, copying silk hangings, is perhaps unique in Great Britain. The local authority is Wiltshire Council, which, after the 2009 local elections, is Conservative controlled. Marlborough lies within the Devizes constituency. There are two electoral wards (east and west) in the town. Their area and population are identical to that quoted above. 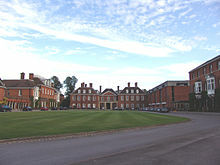 Marlborough College, an independent boarding school, is located on the west side of the town. The town's local authority secondary school, St John's Academy had been considered an above average school and sixth form college by Ofsted, and in the June 2014 report it was considered outstanding. It was formed when the former Marlborough Grammar School and secondary modern school were amalgamated. There is also a primary school, St Mary's. Marlborough is home to Marlborough Rugby Club, who completed their most successful season in recent history in the 2009–10 South West Division Dorset & Wilts 1 North League. Marlborough won all 22 games to secure promotion to the Southern Counties South league. The club has a second XV senior team as well as over 220 juniors from U6 to U15. Marlborough Town F.C. play their home games at Elcot Lane, to the east of the town, and are current members of the Wiltshire League. There is a cricket team whose 1st X1 compete in the WEPL Wiltshire Premier Division. The town is at the heart of the Church of England Marlborough deanery in the diocese of Salisbury in the province of Canterbury. The rural dean has responsibility for the benefices of Marlborough, Ridgeway, Upper Kennet and Whitton which in total comprise 16 parishes. Of the town's two Church of England parish churches, St Peter's has been made redundant and converted into an arts centre. St Mary's, a Grade I listed building, remains in use for worship. The renowned jockey Sir Gordon Richards is buried in the new cemetery on Marlborough common, the second of two such cemeteries to be opened after the two old churchyards stopped being used for burials. Although once served by two railway lines (the Great Western Railway and the Midland and South Western Junction Railway) the town no longer has any direct rail access. The nearest stations are Pewsey (6.7 m), Bedwyn (6.9 m), and Swindon (12.7 m). Marlborough is well connected by road with the A4 from Hungerford to Calne, A346 from Tidworth to Swindon and A345 from Salisbury meeting there. Edward Thompson, second Chief Mechanical Engineer of the London and Northeastern Railway or L.N.E.R. ^ "Wiltshire Community History – Census". Wiltshire Council. Retrieved 9 March 2015. ^ Wells, John (6 January 2010). "Marlborough". John Wells's phonetic blog. Retrieved 5 March 2010. ^ "Marlborough". Collins Dictionary. n.d. Retrieved 26 September 2014. ^ "Marlborough". Wiltshire Community History. Wiltshire Council. Archived from the original on 2 April 2015. Retrieved 9 March 2015. ^ Rees, Abraham (1819). "Marlborough". The Cyclopædia: Or, Universal Dictionary of Arts, Sciences, and Literature. London: Longman. ^ Everett-Heath, John (2000). "Marlborough". The Concise Dictionary of World Place Names (3 ed.). ISBN 9780191751394. ^ Pevsner & Cherry 1975, p. 347. ^ Lund, Ian. "(1) Fire Damage at Marlborough High Street". Institute of Historic Building Conservation. ^ Porter, Stephen (1996). The Great Fire of London. Stroud: Alan Sutton Publishing. p. 3. ISBN 978-0750907781. ^ a b Crowley et al. 1983, pp. 199–229. ^ "Climate Normals 1981–2010". MetOffice. Retrieved 6 June 2017. ^ "Marlborough's Mop Fairs 2014" (PDF). Marlborough Town Council. ^ "St John's Marlborough". Inspection reports. Ofsted. 9 June 2014. ^ Turnbull, Stacey (7 September 2017). "New Marlborough Primary School opens doors to pupils". The Wiltshire Gazette and Herald. Retrieved 8 September 2017. ^ List of main bus routes maps in Wiltshire. The link "Stagecoach map of routes to Swindon" opens a map showing the n° 80 bus route Pewsey-Marlborough-Swindon. Schedules for all travel operators on this service can be found by typing "80" for "Bus Service Number" in Traveline search page. Aston, Michael; Bond, James (1976). The Landscape of Towns. Archaeology in the Field Series. London: J.M. Dent & Sons Ltd. p. 60. ISBN 0-460-04194-0. Pevsner, Nikolaus; Cherry, Bridget (1975) . Wiltshire. The Buildings of England (revised ed.). Harmondsworth: Penguin Books. pp. 333–341. ISBN 0 14 071026 4. Wikimedia Commons has media related to Marlborough. Marlborough website – visitor information, history and local images.